California, like the rest of the country, is rebounding and we hear a lot about the state's overall job growth and success. Much is true but it's important to understand what's happening in manufacturing -- an industry with an average wage around $80k, tremendous innovation and technological benefits, and one of the largest value chain multipliers among all sectors. 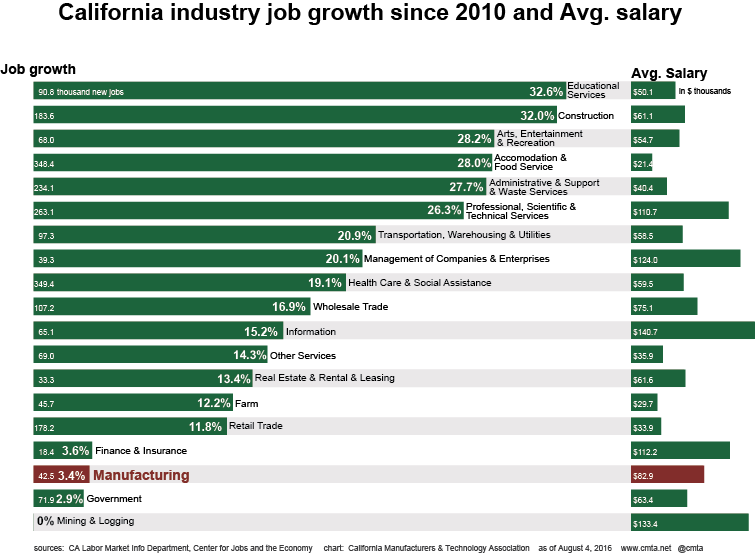 Since 2010 California manufacturing, with only 3.4 percent job growth, is only ahead of the mining and public government sectors by a small margin in terms of percentage job growth. With low manufacturing growth California's middle class loses out on higher paying job opportunities and new technological skills. Further, almost all of our other sectors miss out on increased upstream supply chain opportunities and downstream manufactured goods. Put simply, manufacturing is steroids for overall economic activity and we could be doing so much better!